- enables you to track and reward your referrals from your own referron portal. Empower the champions of your business to refer their friends to you. We all know the power of word-of-mouth referrals, so wouldn't it be great if the champions of your business, those people that enthusiastically support and endorse your products and services, could refer their friends to you anytime, anywhere? Well, now they can with the Referron app. Networking doesn't happen at a desk. Whether your champions are having a mid-morning coffee, lunch at the Deli, an after work drink or enjoying a weekend BBQ, they can instantly refer their friends to your business. There's no time like the present - much better to do something now rather than later. However, with Referron there's no need to leave it until later, your champions can refer their friends to you at the very moment your business is being recommended by them. 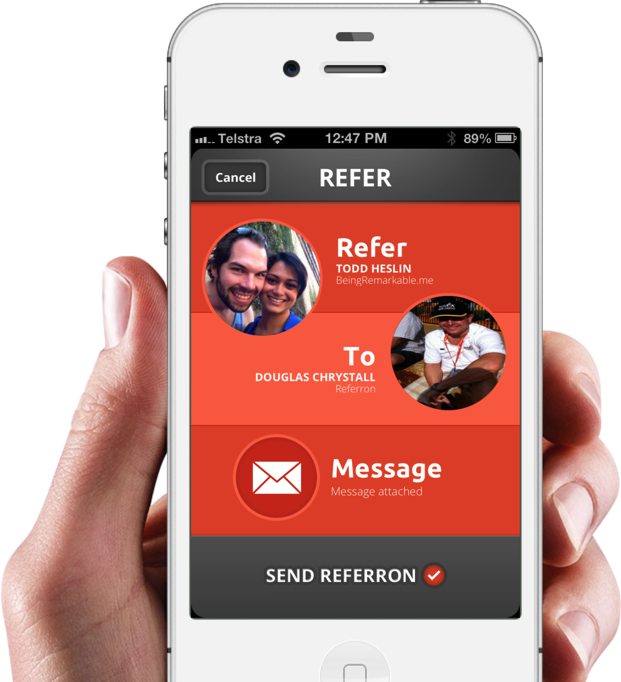 By using the simple Referron app, referrals can be on their way to you in a matter of seconds. Members invite their customers, contacts, associates etc. to be their champions and start referring their friends. Members get access to detailed referral analytics helping them identify their most profitable champions therefore allowing them to increase qualified referrals and revenue.